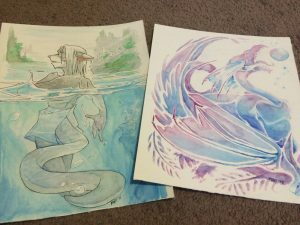 The Endless Art Sale at Storenvy: Round 2! 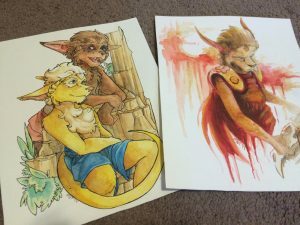 There’s some new artwork up for sale (and Balta and Shanka still hanging out from the last round; their time will come =P ) in my Storenvy shop! If you’ve been watching my Tumblr, it’s mostly art that you’ve seen pop up on Tumblr in the last little bit. Commence: Round 2 of the endless art sale! FIGHT! It’s very much in progress, but it’s already off to a promising start. 🙂 Again, I’ve got to thank you guys for being fabulous and always so helpful and supportive. In this case, especially thanks to J. N. Squire, who’s also the translator and administrator for the French version of Prophecy of the Circle, for starting the new wiki and putting so much work into it already. Yesterday, January 4th, was also a rather nice anniversary for Prophecy of the Circle. It’s officially been five years since I started publishing this story online. I try to mention this wherever it’ll fit, but I’m definitely going to say it again: its been a fabulous ride so far and that’s all thanks to you guys. I will never stop being amazed at what a caring, engaging, wonderful group of people you are. You’re all so constructive and enthusiastic and although I’ve never met the vast majority of you, I know if I ever did, you’d all feel like great friends. You all need to feel wonderful about yourselves, because you are, and you make me feel wonderful. P.S. And for extra bonus fun: today is also the birthday of my big brother Liam, also known as the original creator of good ole Stiggs and Aurorin. 🙂 All the good anniversaries all at once. Best. I hate doing this, but I’m only halfway through painting next week’s comic and I know I won’t have the ability to finish it. There’s been a lot going on in my personal life and it’s beginning to affect me very negatively, so I need some time just to handle it. I don’t really know what else to say, except that if I’m quiet, it’s because my energy levels are low at the best of times, and when they’re not… I just don’t know how to explain all of this. It’ll get better. I’ll be back. Things are just kind of bad right now for creativity. I’ll try and post a doodle for Monday at least, but I don’t think I can guarantee even that bit. Holiday Art Sale Part II: Store’s Open! All right, there are only four little paintings up for now. Three are 8″ x 10″ and one’s about a millimeter shy of 9″ x 12″ because I had a brain fart while prepping the paper and trimmed it to the wrong dimensions (9″ x 12″ is the dimensions of a comic page, in case you’re curious), then failed to notice until it was already inked. Oh well! Bonus. That’s the Calterra one. The comic is always my priority number one, but when I have spare time in the future more things will appear in the shop. Keep an eye on my Twitter, Tumblr, and/or Facebook and you might get to see progress shots of some future offerings before I finish them. 🙂 I might experiment with some different media in the future, too. Not just watercolors. We’ll see how things go! I’ve never done this before, but since I’ve got most of a week left in my vacation from my day job (I just took some time off to de-stress at home) I thought hey, my To Do list is swiftly getting whittled down. I have the time. It’s a good time of year. Why not get brave and offer some art for sale? So I’m thinking I’ll do just that! Let’s see how this goes. I’m not the sort of artist who’s mastered doing commissions and staying sane, yet – I’ve tried a few times and I rapidly turn into a nervous wreck who can’t even draw stick figures when I realize that another human being might be depending on me for something – but I’ve come up with an alternative that still lets me offer you guys something. With any luck, this might build my confidence a bit, too. 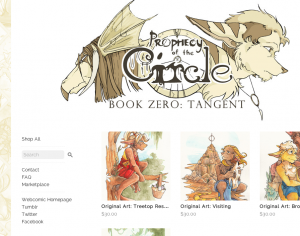 The plan, so far, is to do up a few 8″x10″ watercolor pieces featuring one or two of the characters from Prophecy of the Circle. Since they’re quickies (kind of like an extra super big comic panel; only a couple of hours worth of work each) I’m setting them at $30 USD a piece, with $7 shipping on top of that, and they’ll be first come, first served, for one of a kind original pieces. I’m thinking I can get between 3 and 5 done by the weekend, and I’ll keep making more in my spare time as time allows. I get crazy nervous about making things that people would pay actual money for and shipping them out into the wider world, but ’tis the season, so…. I’ll give this a shot. 🙂 If you ever wanted to own something I made a pretty artistic mess on (or better yet, gift it to a fellow fan! ), now’s your chance. My goal is to post the first couple of these on Saturday. I’ll have more news closer to then (gotta make a few of these things, after all! ), so keep an eye on this spot. If you’re interested in the possibility of a specific character, let me know in the comments. =P No guarantees, especially for the first test batch, but it’ll help me figure out how to prioritize who I draw. 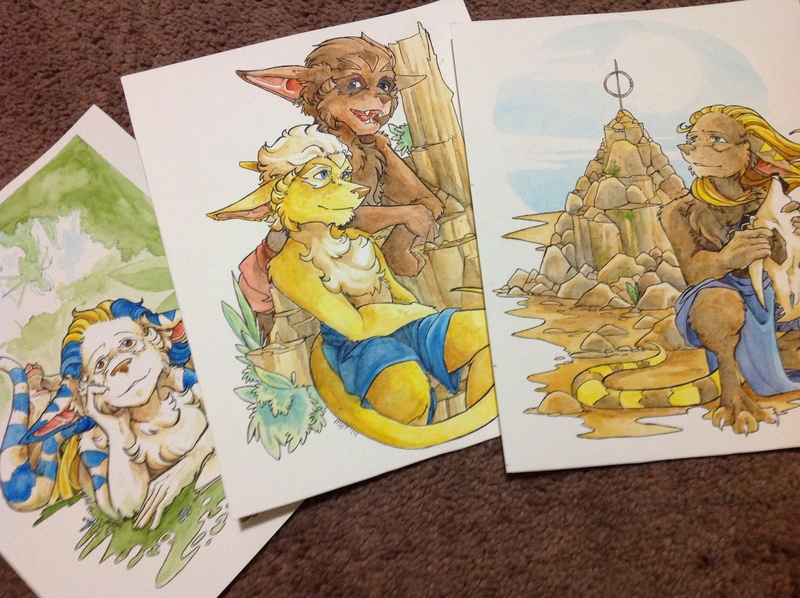 Update: I’ll be going through Storenvy to sell these, and so accepted payments’ll be through Paypal. 🙂 I’ve done some sorting and shipping prices are set at $5 within Canada, $7 for the states and $10 for everywhere else. Still Alive! There’s New Fanart, Too. And with my usual terrible ability to ever think of anything to say in my news post section, it appears that a few months have passed without much of a word from me. Sorry about that, guys. I just have a habit of working in silence and not realizing that I’m doing it. But winter’s approaching, and as a matter of fact, it even snowed today, just so it could prove that point to me. With the colder weather comes a bit of a slow-down in the amount of stuff I have to keep on top of in my everyday life, so maybe we’ll see some progress on a few of those half-finished projects I keep babbling about without actually saying anything (I’m so delightful that way). I do want to pop in here and tell you guys one thing, though, and that’s that you are all a delight. I mean that. It’s been especially apparent with the chatter going on in the comments section over the past few months, but its always been rather true. All of you bring such a smile to my face, and you’re just so genuinely enthusiastic that I couldn’t ask for more or better. It would be a shame if that went without acknowledgement. I love telling stories to you guys because you’re the best audience I could hope for. It’s been on my mind for a bit now that I need to say that. You make this worthwhile. And on a final note, there’s been another bit of fanart submitted, this one by Tim Matthews, also known as that fellow who cosplays my characters with such skill. No seriously, I never dreamed that there’d be fanart even, let alone cosplay; this is an amazing place to be in my creative career. And here I need a gallery to showcase both. You guys are fantastic! I was recently reminded that I have a whole new section of reader creativity to showcase, so I went and added a new section to the Extras (edit: renamed it Fanworks & Extras!) page! It’s really awesome seeing what you guys come up with. … but I suppose it is anyway. Whoops. O_o The time looks like it’s set correctly on my site now, and I thought I fixed it last night, but I guess for the most recent comic post it was still confused and posted it six hours earlier than usual. Oh well. Bonus for you guys! I suppose it makes up for the site being offline for most of yesterday. Wow, that was a lot of work. This place was, however, sorely in need of an overhaul. I needed something cleaner, and easier to update, and less cluttered. I think I succeeded on all fronts and I hope I didn’t break anything in the process. If you do find anything that doesn’t quite work, let me know, would you? I did have to remove some things that I’m sure will, actually, be missed. The first was the encyclopedia. While it was a cool idea in the beginning, over time I just found it impossible for me to keep up to date, and so I finally got tired of it hanging over my head. I feel a story should be able to stand on its own merits anyway, so none of that information was necessary, per se. Still, if anyone else feels they want to pick up that project and continue it – I know there are sites out there designed for wikis and the like – I do still have all of the content from it saved offline, and I’d hook you up with it and give you my blessing. I also streamlined the wallpapers section. There were a few things in there that just weren’t up to my current standards of quality, and I wanted to keep fanart out of it. I hope to produce more for that section as time permits.